Thank you for looking into our online giving program! To give online, visit the link below. 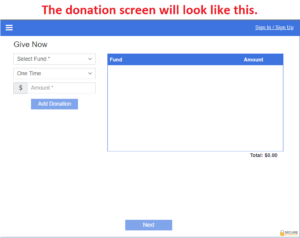 It will take you to a page from our payment processor, Vanco Services, that will allow you to select your donation amount and choose where you’d like it directed to. Please consider selecting the box on the third page that will allow you to also pay for the transaction fees; while it’s not necessary, we always appreciate it. If you would like to set up recurring donations, you may choose to create an account that will allow you to select amount and frequency. All payments are run through a secure server via Vanco Services. Please give the church office a call at 425-746-7300 if you have any questions. Thank you for your generosity and for supporting the missions of Cross of Christ!